For the 10 years we were on our sailboat, whether we were sailing under fair-weather conditions, at anchor, docked on shore, or in a dinghy going from our boat to shore, they did not wear life jackets. 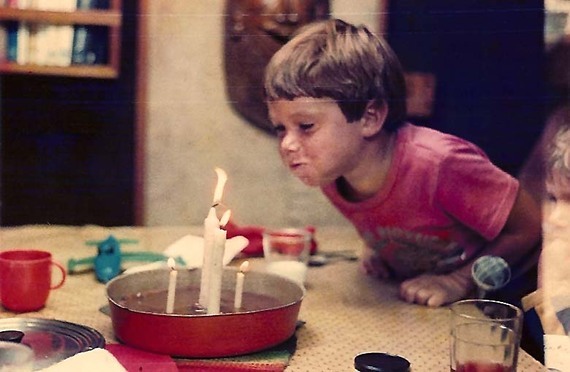 Was this irresponsible, was it reckless, was it total ignorance on our part, us, the parents? No. Our boat was our home -- the only home we had. "No life jackets on those kids?" Yes, that's right. No life jackets on those kids. My blog post "We Sailed Across the Ocean..." from November 11, 2015, recounting our 30-day trans-Atlantic crossing on our sailboat with an infant and a toddler, featured several photos of my children onboard, "sans" life jackets. Some readers were taken aback and posted a comment of surprise and concern. This is not the first time I have had such remarks from -- and here's where I must remind myself -- amateurs, weekend recreational boaters, non-sailors, or at least non full-time "cruisers." No, our children did not wear life jackets. For the 10 years we were on our sailboat, whether we were sailing under fair-weather conditions, at anchor, docked on shore, or in a dinghy going from our boat to shore, they did not wear life jackets. Was this irresponsible, was it reckless, was it total ignorance on our part, us, the parents? No. Our boat was our home -- the only home we had. We had no other dwelling on land. This was it. Not having our children wear life jackets was being realistic about our everyday life. It was about making life in a restricted space, and under such "unusual" conditions, tolerable for two young lads. Our daily reality was that it was not feasible to have two young children bound up like sausages from dawn-to-dusk, every day of their lives. Like all other children, they would eat, drink, play, go to-and-from our boat on a daily basis. We would either be on the ocean for 5-10 days at a time (or exceptionally 30, as when we crossed the Atlantic), or go on shore for shopping, touring around, take the kids to a park, take them to school, or one of many umpteen daily endeavors that one pursues in daily life either on land or at sea. Granted, most people do not live on a boat, day in and day out. For most people, boating is a weekend or summer recreational activity -- surrounded by water, and thus inherently dangerous. I can understand the fear that prevails when being surrounded by water. Before sailing myself, I was fearful. It's a natural instinct for us land-bound creatures. But the reality of the fear of this potential danger is very minimal. 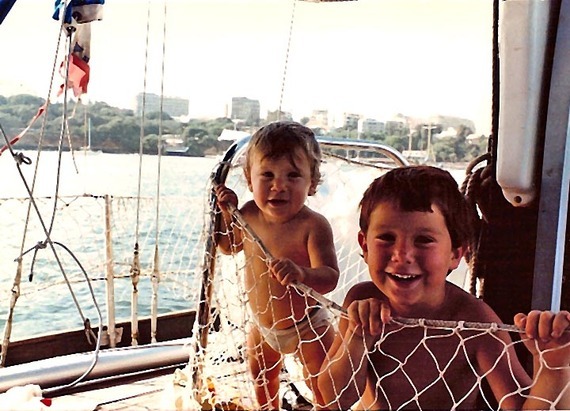 When living full time on a sailboat as we did, we were constantly aware of the danger for our young, non-swimming children (in the beginning as toddlers) on board. We equipped our boat with all the preventive measures possible: a specially hewn board that we could slip into the top entrance leading from the cockpit to below deck, blocking the ladder in or out of the cockpit that our little tykes couldn't step over; an all-encompassing net that surrounded the deck from the front of the boat to the back that wound around the stanchions (or perimeter "deck poles"). We put strict precautions into place: no child on deck in rough or agitated conditions, and if that were the case, but the weather was too hot and gorgeous outside whereby sequestering them inside would be cruel and unusual punishment, they were required to stay in the "sunken" cockpit when outside, under our watch and hands, and they were not allowed on deck. If I were to take this debate on land, imagine children playing in their backyards, where there may be a non fenced-in swimming pool (usually illegal, but just for comparison sake in this case -- and then again, even if fenced in, children can climb fences), and always having to wear lifejackets while they play tag, hide-and-go-seek, swing on the swing set, or even sitting at the dinner table. Or imagine them always tethered to a car seat, or bound by a seat belt as they go about daily activities. No, of course not. It's not realistic and it would be like keeping a young one in a straight jacket. Our children lived a daily life on a sailboat as children do on land: eating, drinking, doing their schoolwork; playing with their toys; coming and going to-and-fro from the boat to land, from land to the boat. Can you imagine your land-bound child always forced to wear a car seat, seat belt, or a life jacket, dawn-to-dusk, 365 days a year? We all know of tragic accidents where children drown at home in their own, or a neighbor's, swimming pool. Innocent children are also killed daily in car accidents, or even hit by cars in front of their own houses -- supposedly, the safest place they could possibly be. I'm willing to bet that more children are killed in car accidents or in swimming pool accidents than those who drown from not wearing a life jacket on a boat or being near the water. Although more sensational news-wise, a child that drowns by falling off a boat, or a dock is a much more uncommon event. This is not to say that we did not have our incidents where our own children fell in the water, (once off our boat, a few times from docks) but we always had an eagle eye on them, and we averted tragedy. Nevertheless, in our 10 years of sailing, we do know of one tragedy where a toddler drowned after falling off her family's boat at anchor. Several adults and other children were even on board, yet she was discovered too late. It was such a rare event that the news was shocking and was broadcast quickly to the widespread and close-knit "cruising" community. Still, I would take this risk any day over the risk of being in a car and not being able to control the actions of a random head-on driver, or one in the next lane. Indeed, most often when we returned onshore after 30, 10, or five days at sea, we were not always at ease crossing a busy city street under the "safety" guise of a crosswalk and red and green lights. We considered this more dangerous than having our children on our boat, without life jackets, where they were under our careful surveillance. And yes, of course, we spent a lot of time and effort from the get-go to teach our children how to swim as early and as quickly as possible in order for them to be water safe. 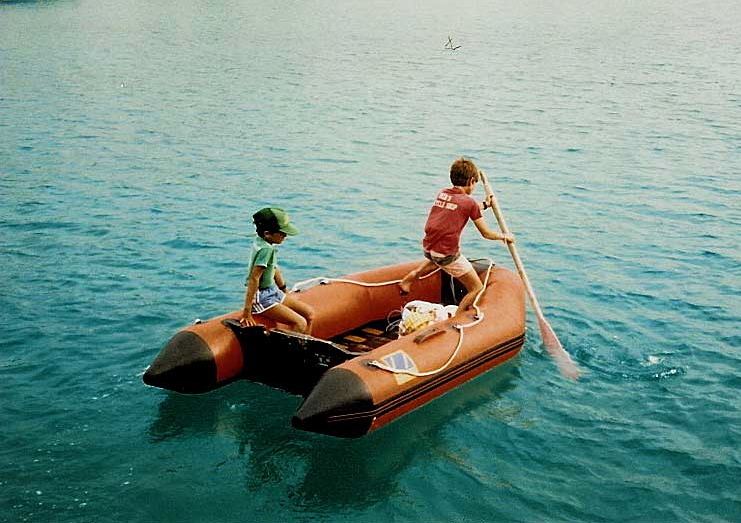 Only once when they were fully competent swimmers did we allow them to take the dinghy on their own and row to shore. No, no life jackets on those kids and no regrets.